Looking for a faith-based college experience with a high-paying job as an end result? Check out religious universities with the highest-paid alumni. It’s possible to attend a faith-based college and still be able to pay off your student loans after graduation. In fact, many of the most famous colleges in the United States have their roots in religious affiliations. 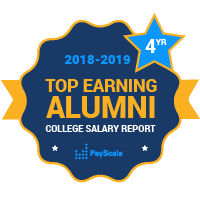 In the College Salary Report, PayScale has ranked all religious colleges in the United States by their earning potential. Santa Clara University is a religious school with highly paid alumni when we poll graduates with a bachelor’s degree and no higher education. This small California school often beats out big names like Duke, Georgetown and Brigham Young University, even though only a small percent of their degrees are in science, technology, engineering and math. Other religious colleges and universities with high earning potentials are Notre Dame, Boston College, Brigham Young University and Loyola Marymount. Going to a religious school doesn’t guarantee a meaningful career, but many alumni say their work is meaningful. Basketball powerhouse Gonzaga University in Eastern Washington is the most highly recommended religious college on our list. About 90 percent of Zags recommend Gonzaga to others.